Chances are you’ve seen an ad by Monsanto, or one of the other big six agri-business giants – Bayer, BASF, Dow, Syngenta, and DuPont round out the club. Most of us recognize an ad easily and understand its motives to impress feel good branding upon us, and create more profit for the company. With the advent of social media, corporate brands have a whole new landscape to build good impressions, and increase their bottom line. Social media sites have democratized information – anyone with an internet connection can create content that others will share, can influence opinion, and can elevate awareness of an issue. Big Ag companies are tapping into that, using social media sites like Twitter and YouTube to engage in conversations in a way that shields their motives, or financial stake in influencing opinion. 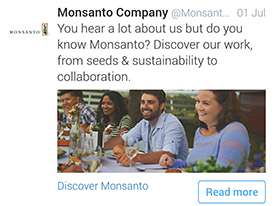 One writer captured a series of interactions she had with Bayer CropSciences and BASF that reveal their tactics to cast their spin as trustworthy on social media. The ability to identify these strategies to influence public opinion, on any platform, creates more engaged consumers of information. That’s a win for diverse, sustainable systems on and offline. To know what to look for, check out the full article on CommonDreams by Food First researcher Teresa K. Miller. This entry was posted in Blog and tagged big ag, food and farming, Food First, greenwashing, social media by Ecology Center. Bookmark the permalink.